One of the most overlooked — yet extremely important — stages of orthodontic therapy is that of retention. After all, we all know that relapse is a serious concern for anyone who has recently completed their orthodontic treatment. Yet for many patients, there just isn’t as much concern for a retainer as there is for their braces. Your patients remember how important it was to keep their braces, appliances, and other orthodontia completely clean. While they’re still in the same mindset, shift that concern to the maintenance of their retainers before they ever leave your office. Clean your retainer with lukewarm tap water. Hot water could cause removable appliances to warp and not fit properly. Use only approved cleansers to lift away debris and prevent buildup, as harsh chemicals could lead to the material becoming brittle, breaking, or discolored. Do not eat with your (removable) retainer in place, as it could cause it to break. Clean around fixed retainers with the appropriate oral hygiene aids, such as a floss threader or water flosser. Don’t let the patient leave without them first watching and then demonstrating the proper oral hygiene method during their retainer “try-in” appointment. Encourage them to see their dentist regularly for preventive care appointments. If something breaks or comes loose, call your office office immediately to have it repaired. Compliance with any orthodontic treatment is hard. Between removable bands and clear aligners, adding in a removable retainer is just as challenging. There are many benefits to incorporating fixed retainers, especially for patients that may be less likely to comply with wearing a removable device. However, it’s vital that these individuals have a firm understanding of how to clean areas that are not visible on the facial surfaces of their teeth. Someone who wore lingual braces may be more likely to feel dedicated about flossing under a fixed lingual retainer than, say, someone who wore removable alignment trays. Removable retainers are still sometimes the best option. When selecting the type of retainer, opting for a clear Essix-type of prosthesis may be better for your adult patients than a Hawley version. When aesthetics is a concern, adults are more likely to better care for their retainer and clean it as advised. Not to mention, many of them like the idea of utilizing their clear retainer as a whitening tray. More than likely, you’ll know which is the better option for your individual patients based on their past compliance, age, maturity level, and the likelihood of relapse due to their unique anatomy. Part of planning for your retainer will be keeping records on hand like models and cephalometric x-rays. The extra angles of interpretation allow you to take various orofacial anatomical structures into consideration: not just the alignment of the teeth. Not to mention that digital ceph films can easily (and securely) be stored in the cloud by off-site providers like CephX for you to conveniently access them anytime in the future. When and if anything needs to be analyzed or re-analyzed months to years down the road, the data is available at your fingertips. Once an adult or teenager gets out of braces, most orthodontists never see or hear from them again…unless there’s a problem. The best way to avoid common problems — like lost or broken retainers, and tooth relapse — is to intermittently assess their bite. Like a jeweler who inspects a wedding ring or diamond jewelry once a year to ensure that the prongs are holding everything in place, an orthodontic patient can benefit from having his or her bite reassessed on an annual basis from their orthodontist. The intermittent appointments allow you to monitor retainer use, oral hygiene, maintenance of their prosthesis, and if any adjustments need to be made. As with other type of dental appliances, an orthodontic retainer can gradually wear out or break. Communicate with your patient that this is normal, and they need to have a new retainer made 5-10 years down the road. You might even want to consider offering the retainer for free as a “courtesy” to people who make their annual follow-up appointments and have been wearing their previous retainer on a routine basis. It can’t be emphasized too much: an orthodontic retainer needs to be worn regularly for life. Even if it’s 20 years down the road, this must be stressed to your patients. Unfortunately, many orthodontic offices do not push this concept enough. As such, many adults come back for re-treatments due to lack of retention strategies following treatment as a teenager or busy college student. For individuals that have — or still are battling — oral health conditions such as periodontitis or TMJ disorder, maintaining proper tooth placement is part of a comprehensive approach to their overall dental care. Be sure to get their family dentist or specialist on board by sending a letter back to their practice once your treatment has been completed. If you haven’t heard from the patient in a while, consider asking his or her dental provider to refer them back for a follow-up appointment. In the days of digital patient information and images, it’s important to know that your patients’ data can be stored safely and securely…especially when you don’t see them for months at a time. At CephX, our cloud based record keeping systems are secured and accessible from any device, anywhere in the world. Now you can securely back up your patients’ old x-rays and other records without them taking up extra space in your office. Contact us today to learn more about our digital AlgoCeph analysis and more. A lot of kids look forward to the day when they finally get to have their braces put on. Unfortunately, that’s not the case for all of them. Either they may have a bad outlook on dental care in general, have fears related to discomfort, or even struggle with sensory issues when another person is working on their mouth. Orthodontic therapy can be just as much about a teen’s self-esteem as it is their dental health. During the initial exam or consultation, ask children what they like best about their smile, or if there’s anything they wish they could change. A concerned parent may think that diastema between 8 and 9 is a big concern, while your patient feels it adds character! Connect with each child personally and add notes into his or her file to remember their interests or hobbies the next time you see them. Are they headed to the state soccer tournament? Did they get a new pet? Maybe they’re taking up a new hobby that they can’t wait to share. With all of the face-to-face time that you’ll be getting in the coming months, a personal connection is vital. With kids growing up in your office, they’ll usually leave as a “friend” once treatment is over with. Let Them See the Pictures! Kids love to see pictures of themselves. Whether it’s a profile shot for their digital file, a cephalometric x-ray, or a 3D digital scan, there’s something about being able to sit back and see what you “really” look like. In orthodontics, we’re able to capture a number of different digital images, scans, photos, and gather other data that a general practice usually does not. With adults, it’s common to use these images to “co-plan” treatment, but we often overlook children’s interest in the same information. Just because they might not understand the same things an adult patient would doesn’t mean they aren’t beneficial during the orthodontic process. Use pictures and non-invasive equipment to show kids what’s going to happen during the orthodontic application process. This is a great opportunity to have models on hand or before/after flip charts to go over. Explain things in simple, easy-to-understand language that is age appropriate. Remember to leave out negative phrases like “hurt,” “sore,” etc. Stick with positive phrases that deflect anxiety and make things seem more straightforward. Talk through the treatment in a non-threatening manner, leaving “scarier” topics like surgery to private conversations with the parent. Finally, talk the child through what’s going on during the actual braces application. They’ll hear you repeating what you’ve already discussed, so they know exactly what to anticipate. Have a mirror handy during exams, so that kids can watch what’s going on, or even use a cheek retractor while you’re taking photos. With them being a part of the action, they’ll feel independent and responsible. Some offices use mobile apps or iPads in the office with interactive videos to review home care, treatments, before-and-after shots, and what’s expected. Kids love high-tech tools, so these are a great resource to utilize in private practices…they also save time on patient education, so that your team doesn’t have to repeat the same thing 20 times each day. One of the biggest challenges during orthodontic treatment is paying attention to good oral hygiene practices. Everyday brushing or flossing becomes mundane at times, especially if there are extra appliances to clean around or the child doesn’t already have good brushing habits. You can encourage mom or dad to invest in special toothpaste, electronic toothbrushes, or water flossers to make tooth brushing a little more fun than it usually is. Or you can consider making these aids available as part of the package price of your treatment. When kids are the only one in the household to have a fun new dental “toy” to play with, they’ll be a bit more inclined to put it to good use. Consider offering quarterly rewards or drawings in your office. Let kids earn tickets or entries into the drawing when they do thinks like stay cavity free, have good brushing habits, keep appointments, etc. Don’t forget about having a “hall of fame” on the wall. Kids usually love to have their photos taken. Consider asking them if they want their picture on the “new braces club” board, or on the wall with everyone’s “after” portrait. It’s an exciting thing to look forward to, once they do finally get their braces on. From different shaped brackets to unique band colors, kids love to customize their smiles with their favorite school colors and more. Find out who their favorite sports teams are or show them which selections might go along with the current holiday. They’ll have something to look forward to at each appointment. There are even companies now that allow orthodontists and dentists to use brackets that are shaped like stars, footballs, and other popular shapes. For someone who is going to be wearing appliances on their smile for several months at a time, this can add a fun twist on conventional orthodontic therapy. Attentive care is vital to running a successful orthodontic business. Your patients — whether adult or child — want an attentive staff and provider that pays attention to them. One of the ways you can do this is by offering accurate therapies that are carefully mapped out, for the most successful outcome possible. At CephX, we utilize innovative AlgoCeph technology so that orthodontic providers around the world can access professional image analysis within a matter of minutes. The data is securely stored and backed up, so that you don’t have to worry about additional privacy concerns. Contact us today and schedule a consultation to learn more! Interest in measuring the human form and skull has been around for millennia. The history of cephalometric analysis stems from Egyptian and Greek attempts at human body measurement (anthropometrics). The term cephalometric is sometimes confused with craniometric. The former refers to measurement of the skull. The latter refers to measurement of the head including the soft tissue be it living or dead. 4000 (BC) Egyptians: Canon of Proportions was a mathematical system developed to give idealistic proportions to the human form. Artistic forms were generated using a grid system. Evidence of attempts at orthodontics and tooth “bridging systems” using wires have been found among the human remains of ancient civilizations. The idea that modern day orthodontics may have originated thousands of years ago, is certainly intriguing. This remaining ancient physical evidence of attempts at orthodontics indicates that the dentition and facial appearance were as important then as they are today. (c.460-c.370) Hippocrates: described two body types. 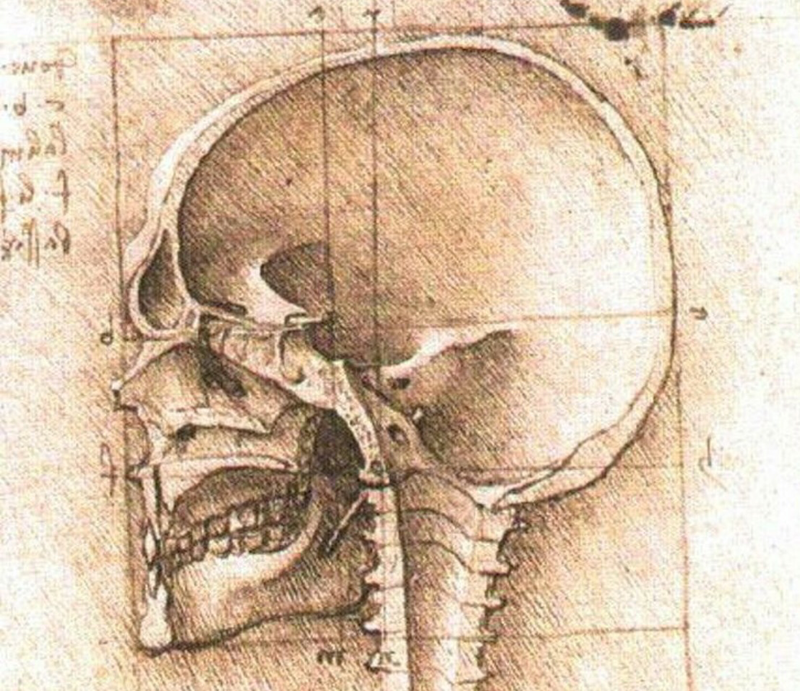 (1452-1519) DaVinci: Arguably the first to try and systematically measure the head. (1528) Albrecht Durer: A treatise on cranial measurements was the first published work in which anthropometry was applied to aesthetics. (1678-1761) Pierre Fouchard: Published the “Surgeon Dentist” in 1728. Some consider him to be the “inventor” of orthodontics. Some of the “less than modern” methods of straightening teeth included finger pressure, metal plates lashed to abutment teeth, extractions and the use of a surgical instrument of the time called “The Pelican”. This instrument was used to make large forceful lingual to buccal tipping movements. If possible, it would have been interesting to talk to some of his teenage patients! (1722-1789) Petrus Camper: introduced the facial angle, facial line and horizontal plane. (1796-1860) Anders Retzius: Credited with introducing the terms orthognathic, prognostic and the cephalic index. Kingsley and Farrar are credited with being the “Fathers of Orthodontics”. Both wrote definitive books on orthodontics during the late 1800s. Edward Angle was a paramount figure in orthodontics. His work in the early part of the twentieth century remains an influence in present day orthodontics. (1895) Roentgen discovered X-rays in 1895 and submitted the paper, “On a New kind of Rays, a Preliminary Communication”. The following year Koening and Walkhoff simultaneously made the first dental X-ray of a tooth. (1922) AJ Pacini is credited with making the first standard lateral view radiograph in 1922. (1922-1931) During this period, various researchers reported on the use of radiographs in the practice of orthodontics. These contributions included the discovery of new radiographic landmarks and various attempts to incorporate and improve methods of diagnostic measurement including attempts to obtain a standardized practical method for obtaining radiographs. (1931) Holly Broadbent along with Todd Wingate (United States), H. Hofrath (Germany) simultaneously developed the cephalostat. Broadbent occupies a special place in the evolution of cephalometrics as many of his principles and ideas have been accepted practice since their inception. 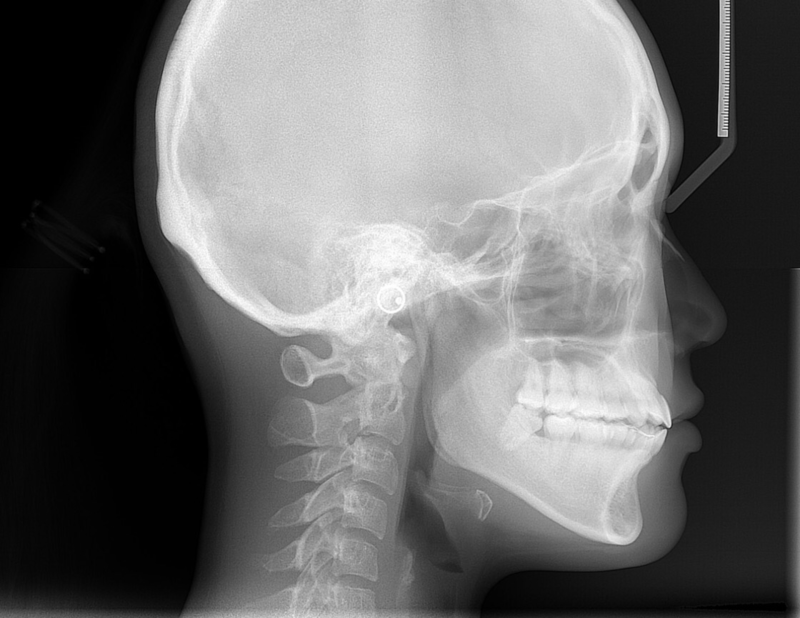 Broadbent used a metric scale and reproducible head positioning of the cephalostat to eliminate the problems associated with previous unstandardized radiographic analysis. (1937-1947) Much of the evolution of cephalometric analysis during this period was associated with investigating the craniofacial growth factors affecting orthodontic treatment (down and forward, Brodie 1941) and other factors relating to the dentation in its relationship to various craniofacial factors, (Margolis 1943, inclination of incisors). Initially, cephalometric analysis was performed manually using acetate tracing paper and a lighted view box. Tracings of pertinent diagnostic lines using established orthodontic anatomical landmarks were drawn using a #3 lead pencil. This method of performing an analysis brings in problems of accurate analysis due to human error and differences of experience and expertise of the analyst. (1971) First used in the United Kingdom. Technology improvements included reduction in time for the procedure due to increased number of slices produced in the same rotational period and increases in image size. Other imaging modalities followed. Initial dental use of CT was necessarily restricted due to the size and expense of the equipment. However, this technology was the basis and cornerstone of today’s use of CBCT in the science of cephalometric analysis. (1995) Tacconi and Mazzo develop a system to utilize CBCT technology for dental purposes. (2001) CBCT was first introduced in the United States after the “New Tom 9000” machine was approved by the FDA. Using a cone beam rather than a fan beam along with other innovations allowed the equipment for CBCT to be reduced in size enough to be installed in the average dental setting and at a (comparably) affordable price. (2007-present) Competition has resulted in different brands of CBCT machines offering their own design, branding advantages, etc. Most often these differences are related to field of view (FOV) and improvements in image resolution. The increased use of CBCT has resulted in the necessity of a parallel technology improvement in rendering cephalometric analyses. Technology has resulted in computerized software models for in-office and online cephalometric analysis. Founded in 2001, the online company Cephx has been at the forefront of developments in CBCT cephalometric analysis rendering technology. These developments in technology allow Cephx to provide orthodontists and other dental practitioners with cutting edge solutions regarding analyses, cloud storage and patient records management. A discussion of orthodontic adverse effects and the signing of an informed consent document are important steps prior to the initiation of clinical orthodontic treatment procedures. It has been demonstrated that patients may listen to an outline of possible dental or medical deleterious side effects, not really understand them, respond negatively when asked if they have any questions and then just routinely sign the consent form as a matter of habit. This type of scenario invites misunderstandings down the orthodontic treatment “road” and experience shows there are usually at least a few bumps along this road for both patient and practitioner. Clinical explanations of adverse effects may be met with nodding heads, but in many cases patients will have hardly a clue what the implications of say, “termination of treatment due to unexpected root resorption” or “exacerbation of temporo-mandibular joint disorder symptoms” may mean. Better to smooth out the road before traveling down it. While practitioners may not use the sterile clinical language as mentioned above when talking about adverse effects of orthodontic treatment or dentistry in general to their patients, making sure the patient has at least a reasonable layman’s understanding may help both parties know that they are “on the same page”. This approach can help mitigate later misunderstandings if treatment or patient expectations come into question. If there is doubt that informed consent may be misunderstood or only partly understood by a layman, a practitioner need only look at the American Association of Orthodontists informed consent (1) form. Although an excellent well thought out document, it informs the patient using dental jargon for the most part. Granted, this dental “language” may be required for legal purposes. Arguably however, it is understandable that a patient might have some difficulties answering an honest “yes” to the signature acknowledgement, “I hereby acknowledge that I have read and fully understand the treatment considerations and risks presented in this form.”. As mentioned earlier, patients routinely glance over these types of consent forms and sign them without really knowing the contents. They generally rely and trust what the orthodontist has told them and leave it as that. A common strategy when attempting to explain complex problems (2) in meaningful layman’s terms is the use of metaphors, similes and especially, analogies. Analogy: compares things so that a relationship between them can be understood. Simile: compares things by using “like” or “as”, e.g., an implant is like the root of a tooth. Metaphor: compares by saying “is”, e.g., An implant is a “tooth root replacer”. These methods may be helpful when outlining the nature of orthodontic treatment adverse effects during informed consent discussions. While each practitioner will have preferences for creating unique analogies (3), similes or metaphors for their own patients and case situations, some examples of possible analogies involving some adverse effects are offered as a starting point. Enamel decalcification – A suggested analogy is a comparison of how household products containing acid may erode, discolor or otherwise damage surfaces. This analogy can be combined with an explanation of how proper oral hygiene practices prevent acid from plaque and food debris from remaining in contact with the enamel around bracket edges, etc., causing “white spots”. Further, that in most cases any damage is usually temporary or can be easily treated micro –abrasion (“sanding”). Periodontal problems – A visual comparison of the attached gingival with a shirt sleeve may help patients understand the progression and damage of periodontal disease from poor oral hygiene practices. A normal attached gingiva equated with a tight sleeve around the wrist, a looser sleeve compared with inflammation and more of the wrist showing – gingival recession. Loss of pupal vitality – A plant may serve as an analogy where the pulp and periapical foramen blood vessels are compared with a plant. Pressure, crushing or cutting of the root (periapical vessels) causes eventual wilting and “death” of the plant. Temporomandibular Disorders (TMD) – Many patients are likely to have suffered a “sore jaw”. However, it might be helpful to relate the Temporomandibular Joint (TMJ) to a door hinge with a spring where repeated opening and closing of the hinge (TMJ) may cause the spring (muscles) to malfunction. Root resorption – Although the exact reasons for root resorption are not understood, a comparison of an icicle shrinking with warmer temperature may be a good visual for a layman’s understanding. Soft tissue damage – Any comparison of a hard object rubbing against a softer object could serve as an appropriate analogy for this adverse effect. One example might be how a carpet is damaged (traumatic ulcer) by excessive foot traffic. Occlusal adjustment – Regarding the need for occlusal equilibration, any analogy that relates sanding an object so that it fits together correctly with another object would be apt. Another suggestion for appointments that involve informed consent is to have patients repeat back in their own words their “take” on what has been discussed regarding informed consent and adverse effects. “A picture is worth a thousand words” is certainly true when attempting to explain dental terminology and procedures to laymen patients. The use of images and/or drawings combined with verbal analogic explanations may increase the chances for understanding by the patient. If patients are having a difficult time understanding a concept, the use of photos (4), pictures and/or drawing a sketch may often be very helpful. No art degree is required here. A simple pencil drawing of a tooth root followed by shorter and shorter shrinking tooth root images should suffice to demonstrate root resorption. A notebook, tablet or computer containing selected photos and/or pictures from the orthodontist’s own practice or internet sources might be worth a small investment in time and a larger later investment not only in patient education, but helping to prevent future patient misinterpretations. The approach of using analogies, similes and metaphors for helping patients understand orthodontic adverse effects can be applied to other areas of treatment such as cephalometric analysis, wisdom tooth extraction etc. Some practitioners may find this analogy, simile and metaphor patient communication method comes naturally to them, while others may find it difficult, cumbersome, seemingly unnecessary or awkward. However, the idea that good communication does enhance patient rapport (5), possible choice of an orthodontist (6) and/or prevent future “difficulties” may be a worthwhile incentive to practice a bit and give these ideas a “dental…….college” try. Save time and effort analyzing your cephalometric radiographs while helping your patients better understand their own treatment plans by visiting Cephx. Discover the advantages of online cephalometric analysis in this area of patient care and more at Cephx. Reticent Orthodontic Patients – What’s On Their Minds? A consultation, a new referral, the elementary school child, the “whatever” teenager, the adult patient, what goes through their minds about orthodontics that they don’t vocalize to their practitioner for whatever reason. What are the common concerns, worries and problems of these quiet and reticent orthodontic patients that may remain unspoken and lead to referral patients declining initial treatment, misunderstandings about adverse effects, unrealistic expectations or general poor patient rapport? It’s true that patients are seen over a period years, but with increased competition, auxiliaries performing more procedures and time management appointment philosophies limiting time to really talk to a patient, opportunities to initiate a real patient/doctor dialogue may be missed. There are numerous studies on healthcare patient interactions linking perceived “good” communication and positive trust issues 1 as a major factor driving patient satisfaction, rather than other parameters of clinical treatment. Reticent Orthodontic Patients – Great Expectations? Informed consent is one of the primary standards of care in healthcare. Usual orthodontic consent and treatment plan discussions center around final cosmetic and functionality aspects, possible risks and limitations of treatment, special case considerations as well as patient responsibilities for ensuring optimum treatment. Unfortunately, it is not unusual for patients to sign medical and dental consent forms as a matter of routine behavior without reading them, understanding them, or asking any questions. This occurs even after participating in treatment discussions and responding negatively when asking about any questions. This can result in later misunderstanding especially for those patients who feel that questioning a dentist is “inappropriate” or they subscribe to the “dentist/doctor knows best” philosophy. Areas where adults, teenagers, children and parents may have difficulties in articulating their concerns, communicating adequately, are embarrassed, socially awkward or a myriad of other reasons, fall into some common categories. Economic difficulties are a major concern of parents and adults undergoing treatment. Orthodontic treatment is a large investment of time and money. Many patients do worry about the cost and may be hesitant to reveal certain personal details concerning family finances e.g., whether they should delay treatment until they save enough money; will it be worth it and so on. Making concrete, sympathetic and reasonable individualized payment arrangements helps to allay financial concerns, affect choosing an orthodontist and may open a dialogue making a difference in starting or rejecting treatment. A sub economic issue concerns transportation problems associated with taking children out of school, missing work, driving the child to appointments etc. Coordinating appointments as best as possible with individual patient situations allows them to voice their concerns rather than bottling them up. Pain issues may not be brought up prior to treatment. Children may be afraid to ask. Orthodontic advertising tends to minimize any references to pain. Adults may “tough it out” without notifying the practitioner, but inwardly resent having pain. Being upfront, sympathetic and providing information on pain management encourages patients to be vocal about their pain so that this side effect of treatment is not “stuffed” and then comes out later as a misunderstanding. Appearance issues with braces have become less of a problem with orthodontics becoming more popular and accepted. Colored rubber bands, shaped brackets, ceramic materials and Invisalign treatment have minimized some of the “metal mouth” caricatures, especially for the child. However, bullying of children with braces can remain a problem 2 and efforts on both the dentist and parent should be directed toward encouraging reporting of bullying. Speech and diet concerns become an issue when patients experience real problems giving up foods that are detrimental to braces. Some patients may also experience speech problems with some appliances i.e., palatal expansion devices. Patients should be encouraged to report problems with maintaining dietary restrictions and feel empowered by dental staff to verbally report problems and seek advice without fear of “rebuke”. Duration of treatment resentments may crop up at any point even though this parameter of treatment supposedly is universally understood as a core part of “having your teeth straightened”. Patients may grow tired of the length of treatment and lose their commitment to hygiene, internally complain and resent treatment. Rather than asking perfunctory questions like, “How are you doing?” or “Any questions?” and exiting the operatory for the next patient, a better approach may be to periodically take a few minutes and encourage the patient to talk about themselves and have a real conversation. A New York Times blog 3 with supporting research about the difficulties of speaking up at the medical doctor’s office readily reflects the same dynamics regarding the dental practitioner. There is a well-known dynamic where people may feel vulnerable or intimidated in a medical/dental setting. The prospect of speaking up, viewed as complaining, or asserting their views for some patients represents a possibility for negative consequences impacting their care. This dynamic along with the ones listed under the heading above have resulted in various recommendations 4 to improve patient/practitioner communication. L.A.S.T. is an acronym outlining a four-point list that might be used by busy orthodontists to help their patients feel better about “opening up” and lead to better patient rapport. Listen: Take a few extra minutes to really connect with patients. Apologize: “I’m sorry, next time let’s try and communicate better concerning your worries about your child being teased while wearing braces”. Speak: Encourage patients to speak their mind without fear of judgement. Thank: Let patients know you appreciate it when they are vocal about their concerns. Busy orthodontists need as much time as possible to devote toward direct patient care and communication. Manual cephalometric analysis and tracing are time consuming and one area where extra time can be freed up for important communication aspects of practice management including more time understanding reticent orthodontic patients. Computerized cephalometric analysis now allows for multiple analyses and cloud storage within seconds. https://cephx.com/wp-content/uploads/2017/01/girl.png 478 640 Danny Abraham https://cephx.com/wp-content/uploads/2018/10/CephX-by-ORCA-Blue-11.png Danny Abraham2017-01-29 14:32:262019-04-09 14:07:52Reticent Orthodontic Patients – What’s On Their Minds?